I am super excited to be a part of the Stuck in a Good Book Giveaway Hop, hosted by I Am A Reader, Not A Writer and Stuck in Books. This is my first signed book giveaway and I can't wait to share this amazing book with someone else. 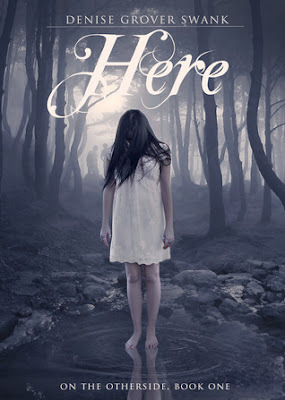 Today, I am giving away a signed copy of Here by Denise Grover Swank. Enter the rafflecopter below for you chance to win and be sure to stop by the other blogs in the linky below to check out their blogs and enter their giveaways! Classmate Evan Whittaker paid Julia no attention before the accident, let alone after. Now suddenly he's volunteering to tutor her and offering to drive her home. She can't ignore that his new obsession started after his two-day disappearance last week and that he wears a pendant she's been drawing for months. When the police show up one night looking for Evan, he begs Julia to run with him, convincing her that Monica is still alive. Julia agrees to go, never guessing where he's really from.